but that we all have to be Creative. then we would all lead more peaceful and fulfilled lives. Taking the time to Create a special dish for dinner. Planting a dozen seedlings in a pot and watching their growth over 12 weeks. Spending half an hour every day reading from a novel. Finding fifteen minutes to journal twenty things you are grateful for. Adding a beautiful image from a magazine to your inspiration board. Each day we should prioritise a small effort to adding Creativity to our lives. I know that one area of my own Creative journey that inspires every person who sees it . . .
. . . . is my Inspiration Wall. It changes from year to year, with a few constants staying in place, but otherwise it evolves quite dynamically over the space of twelve months. So each year, I choose a phrase to guide me and propel me forward – growing, learning, becoming happier. This year it is “Take Flight” which I mentioned here. I then add little bibs and bobs to it until the wall is completely full. This is it so far in 2015. 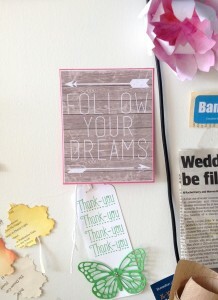 And can you see that lovely little sign “Follow Your Dreams”? 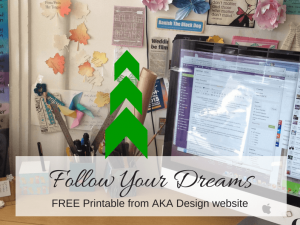 That was a FREE printable from the generous and talented Shannon @ AKA Designs. I just love her ‘style’ – it’s eclectic, honest and completely reproducible here in Australia. 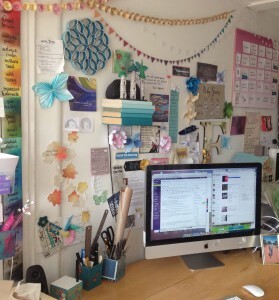 So maybe one of her FREE printables will be enough of a encouragement to Create your own Inspiration Wall. You will be amazed at how much simple pleasure it will bring you. So hop to it my lovely . . . . 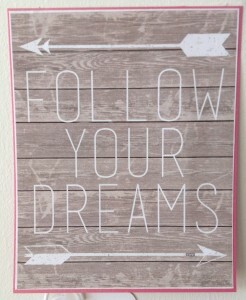 Follow your dreams and be happy.